Red is an interesting color element in the patterns of many snakes native to Tennessee. The color serves different purposes for different species; corn snakes and midland water snakes use it to help with crypsis, while milk snakes use it aposematically. Many, including ringneck and red-bellied snakes, only display red on their ventral surfaces, which they will expose only during predatory encounters. In other species, the adaptive function of the color remains a mystery. Corn snakes (Pantherophis guttatus guttatus) are medium-sized snakes that climb well. 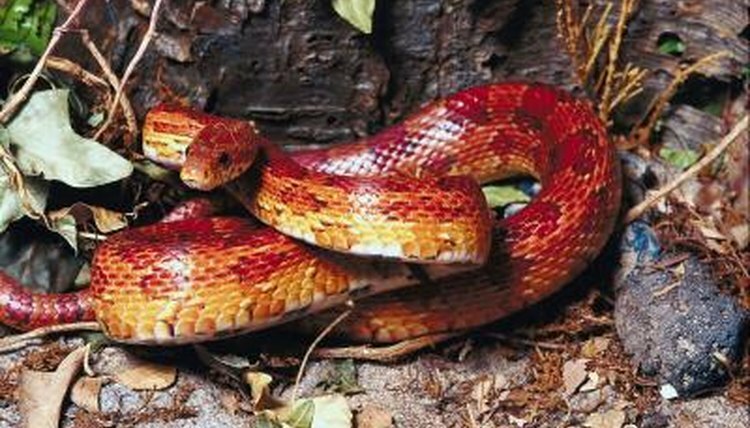 Corn snakes are constrictors that primarily prey on lizards, rodents, birds and their eggs. While corn snakes have highly variable color patterns, most have a grey to orange ground cover, on top of which sit square, orange to red blotches. These red and orange markings help the snakes to camouflage with the dead leaves of the forest floor. Four closely related species from Tennessee -- eastern milksnakes (Lampropeltis triangulum triangulum), red milksnakes (Lampropeltis triangulum syspila), scarlet kingsnakes (Lampropeltis elapsoides) and scarlet snakes (Cemophora coccinea) -- live roughly similar lifestyles and display prominent red markings. Scarlet kingsnakes and red milksnakes feature ring-like markings of red, yellow and black. Scarlet snakes and milksnakes have blotched patterns, with bold red markings along their dorsal surfaces. All are secretive species that primarily consume snakes and lizards, though scarlet snakes eat reptile eggs, and eastern milksnakes add rodents to their diet. Four different species native to Tennessee inhabit aquatic habitats. Red-bellied water snakes (Nerodia erythrogaster erythrogaster) have unmarked red bellies and dark dorsal surfaces. Midland water snakes (Nerodia sipedon pleuralis) are variably colored, but usually have a red or orange tint to their boldly marked bodies. Broad-banded water snakes (Nerodia fasciata confluens) do not have a lot of red content in their markings, though sometimes their blotches feature shades of red. Mud snakes (Farancia abacura) are shiny black dorsally, while their ventral surfaces feature red and black checkerboard markings. Broad-banded and midland water snakes are dietary generalists, though mud snakes only consume elongate salamanders, and red-bellied water snakes prefer frogs. Ringneck snakes (Diadophis punctatus ssp.) and red-bellied snakes (Storeria occipitomaculata) have similar lifestyles and habitats. Both live in the leaf litter and under surface debris, where they hunt earthworms, salamanders and other snakes. The dorsal surfaces of both species are brown to black and unmarked, except for a ring or light-colored markings near the neck. Ventrally, both snakes have bold colors that vary from yellow to orange to red. Some ringneck snakes display their bright bellies to perceived threats. Coachwhips (Masticophis flagellum) are primarily brown to black snakes anteriorly; however, their tails sometimes display hints of red or pink. The reddish tint to their tails -- though not always present -- serves as a useful identification tool. These fast serpents look similar to black racers (Coluber constrictor ssp.) -- with which they share similar behaviors and habitats -- except that black racers never have reddish tails. Coachwhips eat anything they can catch; lizards, birds, snakes and insects are common dietary items.